Summer starts today! Super good IPA. My first blog that anyone might read! Yay! So, welcome! And you'll notice now that there is a comments section for you to add your opinion. And I hope very much you do. Apparently, 1st June marks the beginning of Summer (although the 21st is the middle - how does that work?) Anyway, it's a Sunday, so I went for a long run this morning. When you like cheese as much as I do, you just have to up the exercise level to allow for it. Fortunately I enjoy running, and am planning on the marathon here in November, so need to get the kms in. The last thing you really feel like after returning from a run is drinking wine (not till later anyway) and so I decided to have a beer. But not just any beer. 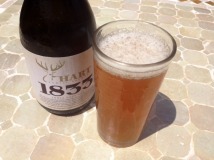 I opened a large bottle of Hart Family Brewers 1833 IPA. I have to declare an interest at this point, and not just in how wonderful the beer is. It is brewed by my old friend (and one-time flatmate) Rob Hart, who with his lovely wife Sarah, gave up everything to live the dream and open a brewery in their home town of Wellingborough (old joke: Wellingborough without the bingo is well rough). The building they operate in was built in 1833, and it was the lintel stone that gave this IPA its name. The other beers are all given a simple number, and stylish label with a colour scheme, to let you know how golden/tawny/dark the beer is. Rob is, I believe, not a great fan of the often-silly made-up names that seem to infest proper beers in England, both small and large. 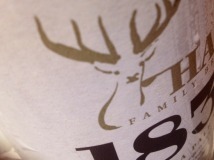 So Randy Tadpole or whatever gave way to 1833 - no bad thing. The beer is, as you might expect from an India Pale Ale, golden in colour, and very refreshingly hoppy. The kind of lipsmacking bitterness with a citrus edge that makes for great refreshment. Bitterness is one of those flavour sensations that is hard to describe in a positive way. As babies and small children we reject this flavour component for the very simple, intuitive reason that most poisonous things are - albeit coincidentally - bitter. This is why it is so hard to give spinach to children. The opposite of bitterness is sweetness, and this is why it is so hard not to give sweets to children ("I am not hungry of sausages, I am hungry of sweets," as a 2&half;-year old Ben once said. As we grow older we lessen the amount to which we sweeten bitter things (coffee, chocolate and tea principally). Our tastes develop, and we start to enjoy spinach, broccoli and olives and things like that (although we appear to become recidivist in old age - shudder). Hops are about the most bitter thing we enjoy, which is why people who really enjoy a chocolate covered ice-cream on a stick on a hot day, are perhaps less likely to derive pleasure from a decent beer as I am. To give this post a slightly wine-y edge, I can also point out that temperature is very important here. If you chill something that is bitter, you will make the bitterness stand out all the more - have you noticed that when you pull some 80% cocoa chocolate straight from the fridge it is all crunchy, chalky and bitter, and only by the time it has got to room temperature does it taste good again? Same with hops, which is why Lager (lightly hopped and relatively insipid) should be served chilled (very chilled indeed if you share one particular friend with me! ), but ales should be served less cold than that. But not 'John Major' warm. Oh no. It is all a matter of choice of course, but this is fundamentally the reason behind serving white wines cold, and red wines not. Red wines often (usually in fact, but not always) have tannin in them, and this is responsible for bitterness (as it is in tea). Serve these cold and they will taste more bitter. So red wine less cold. Some red wines have no tannin so they can be as chilled as you like - look for relative paleness to the colour. Anyway, back to the beer. A wonderful refreshing brew to accompany the first really hot day of the year, on the terrace feeling mildly smug after a run. Cheers Rob and Sarah!